There’s a great ongoing debate on the value and propriety of preserving selective manmade reminders of our national heritage. In a diverse society such as our own, there are bound to be some major differences of opinion on this subject – so whose opinion should win out? Should the offended segment of our society always rule the day – in the name of assuring total peace and harmony within our ranks? I’m convinced that every statue, monument or symbol that instills pride in one segment of society is going to be hurtful and distasteful to another segment. Some argue that there is intrinsic value in the preservation of every tradition, tomb and tome – if for no other reason than to learn from mankind’s past – both the good and the evil. This is not a new debate confined to American history. It’s one that’s been going on from time immemorial. But the practice of seeking out and preserving the relics of by-gone eras that provide us with snapshots of where we have come from as a species, is actually fairly new in earth-time. In fact, the father of archaeological excavation was William Cunnington (1754–1810). In ancient times it was common practice for a conquering people to destroy all religious and political symbols of the conquered – so as to demoralize and control them. Also, in past centuries, the primary concern was survival, not intellectual understanding or moral maturity – so historical markers were often destroyed – new civilizations were built on top of older decaying ones, re-using whatever retrieved materials could be salvaged for the new construction. Even in modern times a former American President seemed to discount the importance of the symbols of our heritage. In the heat of his first campaign, he constantly criticized his opponent’s supporters as “bitter clingers.” He saw them as stubbornly clinging to their traditions, clinging to their patriotism, clinging to the symbols that adorn their public buildings, monuments and money, clinging to the Constitution and the rule of law, clinging to their Christian faith and its demands on their private and public lives, and clinging to the principle of American exceptionalism which justifies every person’s right to life, liberty and happiness. While it may seem that this characteristic of “clinging” to our traditions and our past is more typical of modern social and religious conservatives, I believe that it’s innate to every culture to search out the relics, objects and symbols of by-gone eras that define humanity’s history. A desire to understand and retain a part of one’s past does not presume adherence to or agreement with the creed represented by the objects our predecessors created. That’s why even non-believing explorers enter remote and dangerous terrain, from ice-covered Mount Ararat to the arid deserts and militarized zones of the Middle East, Africa and Asia seeking the “lost” articles referenced in ancient “Sacred” documents. That’s why societies build churches, temples and shrines over the supposed sites of significance, like the grave of Christ, or where Jacob wrestled with the Angel of the Lord or where Mohammed received a message from his god. That’s why some encapsulate and venerate artifacts and relics of supposed holy men and women and why artists of every era and culture have sculptured marble statues of their “saints” and enshrined them within their local worship centers or captured their likenesses in paintings and in stained glass. And that’s why even those humans less “spiritual” over the ages have bonded with and sought to honor their nationalistic and ethnic heroes by erecting museums and statues and set aside monuments and battle sites for future generations to study and appreciate those who came before them and their values and belief systems. But every age also has some misguided souls who, in the name of political or social or religious correctness attempt to erase from history the evidence of our past. Fortunately most of the world stands up and puts a damper on such destructive efforts when they occur. At the beginning of the new Millennium the world was outraged when the Taliban (Islamic fundamentalists) blew up two giant 1700 year-old statues of Buddha at the foot of the Hindu Kush mountains of central Afghanistan and destroyed all Buddha statues in the Kabul Museum. And fourteen years later there was similar outrage when the Islamic State began to destroy and steal much of the cultural heritage of Iraq, Syria, and Libya, including Christian, Hindu and other places of worship and historical artifacts. And when in “civilized” North America, a PC culture at the highest levels of government, educational institutions and the media sought to erase all memory of many of the early explorers of the New World, of others who tamed the West, and of course, the leaders of the former Confederacy, men and women on both sides of the political spectrum rose up to limit the damage that others sought to impose. Mankind as a species seems to understand that preservation of its history in no way constitutes universal agreement with our ancestors’ politics, mores or religions. As a Christian, my first instinct is to search God’s written Word for guidance on this topic. And I find that God’s people were encouraged, sometimes even directed to memorialize events that typified His divine intervention in their world. Moses and his sister memorialized in song God’s defense of the Israelites at the crossing of the Red Sea. Forty years later when their children crossed the Jordon on dry ground opposite Jericho, Joshua directed each of the leaders of the twelve tribes to carry a large stone from the middle of the Jordon, and to transport a corresponding 12 large stones from the Promised Land and pile them in the middle of the crossing point as a memorial to God’s power and faithfulness to His promises. Samuel, Jacob, and other men of God established pillars and anointed them as reminders of situations in which God intervened on behalf of His people. Furthermore, God sanctioned the celebration of festivals and various accompanying traditions as constant reminders of His work in His people’s lives. And of course the celebration of communion was established by the Son of God to be performed frequently by His people in remembrance of our Lord’s shed Body and Blood for their salvation. I’m convinced though that some evidence of past Truth is lost or hidden forever – specifically to test mankind’s willingness to accept and believe in God’s love, grace and mercy toward His primary creation. I appreciate the efforts that so many archaeologists of every faith put into a constant search for such “lost” evidence of God’s intervention in men’s lives, or in trying to prove what may be unprovable. But I wonder if the discovery of Noah’s ark or other such sought after relics of history would actually advance Judeo-Christianity in the eyes of the world, or lead souls into the Kingdom of God. I think the Bible is clear that memorials sanctioned by The Almighty are intended to increase the faith of the People of God, not to draw unbelievers into the Kingdom. In one of our Lord’s stories, Jesus told of an unrighteous rich man who found himself in an after-life of torment in Hades. Realizing he could no longer change his own plight, he sought to save his living brothers from a similar destiny. He begged Father Abraham to send Lazarus back from Paradise to warn his brothers. The Patriarch explained that the rich man’s living brothers had the writings of Moses and the Prophets; that if they didn’t pay attention to the sacred words, not even a person sent back from the dead would be sufficient to convince them to change their lifestyles. We see this principle demonstrated in the last hours of Jesus’ life, as the very people who had witnessed miracle after miracle performed by Jesus, still joined in the chant “crucify Him.” If a witnessed miracle does not change a hardened heart, neither will any statue or monument or church building or relic of a saint. No! Traditions, Tombs and Tomes don’t “prove” anything to the man or woman who has no interest in pursuing and knowing Truth – whether that’s religious truth, social justice truth, or whatever. Still, all memorabilia have some value to both the adherent of the principles that it represents and to all who seek to understand his/her past. On the other hand spiritual memorabilia are specifically for the comfort of the believer and follower – to provide a firm foundation, to cement their confidence and to provide that assurance of the revelation they’ve already received and in the One they already Love and in Whom they already have expressed their faith. It’s wonderful that many of our local churches are so youth and child focused – for indeed the future is our younger generations. But when a creative director’s histrionics are traded for spiritual substance, when technological gimmickry become the primary means to generate (or fabricate) that “feeling” of the Holy Spirit’s presence, and when panel discussions replace well-researched and anointed messages from the Pastor, you have reason to question whether something has gone seriously awry. One has to wonder if leadership is aware or even cares that wedges are being driven between Gen-Z’s and their elders who gave/give so much to lay the foundation that others seem intent on fracturing. If it’s the latter, only one thing remains to be answered: will they continue to drive out the seasoned citizen or simply wait to bury us as, one-by-one, we succumb to the adverse effects of theatrical fog and mist? Does leadership even give a wit about our health and welfare, much less our concerns about the spiritual state of the Body? The city of Strasbourg (France) is the official seat of the European Parliament. Ever since its completion in December 1999, the main tower structure, called the “Louise Weiss” building has raised eyebrows and questions. Its promoters describe its peculiar appearance as reflective of the “unfinished nature of Europe.” It was intentionally designed to look like the Pieter Brueghel 1563 painting entitled “The Tower of Babel.” The ancient tower which theologians recognize as the unfinished work of Nimrod, who was building a tower to defy God, is an interesting source of inspiration for a modern democratic institution. The professed intention of Strasbourg building’s lead designer was that the EU Parliament would complete the original goals of these ancient peoples. I challenge those history buffs among you to research the proposed official poster promoting the Parliament Building. The poster was eventually banned due to protests by numerous groups, but it clearly reveals the mindset of the builders. The poster showed the people of Europe rebuilding a replica of the tower in Pieter Brueghel’s painting. At the very top of the poster were reversed pentagrams (upside down stars.) 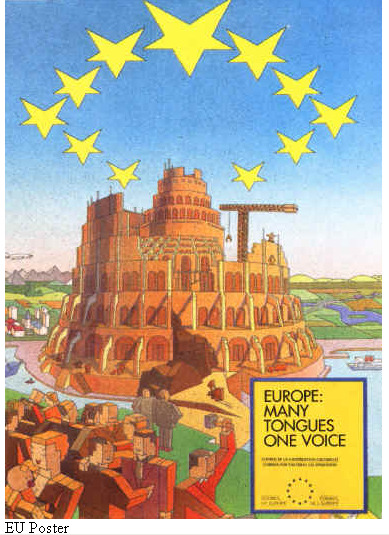 And the poster’s slogan was: “Europe: Many Tongues One Voice,” inferring that the activity of Parliament would reverse God’s punishment for the idolatry and arrogance of the people of the world. Even those of you who see this as a silly religious conspiracy theory must admit that the inspiration behind the Louise Weiss building oddly seems to align with the esoteric beliefs of the world elite and their fractured understanding of ancient scriptures. Just one more thing to think about in the light of recent world events. Most true followers of Christ are so confident and self-assured in their faith and trust in the message of the Gospel, that they have a difficult time understanding how another person could reject that message. 2000 years ago every Jewish man and woman living in the “Promised Land”, whether religious leader, political bigwig, simple carpenter, farmer, fisherman, tax collector or housewife, each Sabbath attended synagogue and should have had a good familiarity with the Scriptures that they heard recited and discussed. They all should have been looking for the foretold signals of their Messiah’s Coming. But even the “Chosen People” let their family lives, their daily needs and worries, their know-it-all attitudes of religious superiority, their desires for power, wealth, comfort or prestige distract them. In contrast, a few men from a distant land with a yen to understand the universe about them, were drawn to investigate this new star that suddenly appeared in the heavens. I imagine when they first noticed the unusual star, it was their curiosity and thirst for knowledge that drove them to research its source and meaning and purpose. And at some point they concluded it was a sign from God that they had to pursue. As 2016 draws to an end, signs of God’s glory are all around us; as are the coming to pass of events long ago prophesied, and the unveiling of each person’s purpose on this earth. Those who know what they are looking for, recognize what they are looking at. Whereas those who choose to turn a blind eye to the truth set before them, will never recognize the significance of what they’re looking at. The unbeliever is in a real pickle, as he’s imprisoned within walls of unbelief that he personally constructed. The only thing that will break down those prison walls is that first humble step of acknowledgement that “I don’t know everything; I want to know the truth; show me.” And only the unbeliever can, of his own free will, take that step. Scriptures say: “Seek and you will find;” but most out of pride will neither read the Book which contains that promise nor acknowledge its Author. How Credible is the Prophetic Today? How do you feel about the operation of the prophetic in the Church today? As a Biblical ministry I accept it; but I tend to be a bit more skeptical when I hear someone claim they’ve received a divine word foretelling a specific future event. Such was my attitude when a former co-worker friend emailed me an audio interview by a Christian website of a previously unknown “prophet” concerning a purported five-year-old revelation about the 2016 Election. While I felt I owed it to my friend to at least listen to the premise of the prophesy, I expected to reject it well before its conclusion. Instead, at about the fifteen minute mark of the interview, I was reminded of a “vision” that a church friend of mine claimed he received while attending a 1997 Promise Keepers conference on the National Mall in Washington D.C.
As I reminded some FaceBook friends a couple days ago, I’m sure that the people of Israel were similarly skeptical when advised that the most likely candidates to be used by God for their nation’s restoration at their respective times in history were the worldly King Cyrus or the loud and boisterous King Nebuchadnezzar. And yet!!! One who is offended by another’s assessment of their life choices indicates a degree of insecurity in those choices. In contrast, anyone who is truly confident in their choices and beliefs, their conscience will insulate from even the harshest of words. A snapshot of my life reveals a series of career and life choices that many in modern culture, the media and even my old circle of friends today publicly revile: lawyer, government employee, executive in the military-industrial complex, political and social conservative and Christian. I’ve been unfriended occasionally on social media, but have never unfriended anyone. I feel that every individual deserves respect and a fair hearing on their beliefs, if they choose to share them. But we live in a society that’s much different than the one I knew as a child and young man. My home was a safe place – but the outside world (my neighborhood, my school, my places of employment) all were jungles that I had to learn to deal with or be labeled a mama’s boy. Today society tries to over-protect young people (with the odd exception of the most innocent of all, the unborn child), and demands the creation of “safe zones,” castigating anyone who violates those zones. The result: a society of new entrants into the adult population easily offended and unable to deal with even the most basic of challenges that life will inevitably throw their way. This is evidenced every day across social media. The adult world is not as nurturing as the one that protected these young people in the classroom, so when they freely express their views about life in the public domain, expecting others will agree with them, they get a rude awakening. Few know how to respectfully respond to those who hold contrary opinions nor how to deal with even the most modest critiques of their own life choices and beliefs. Whatever a person’s beliefs and choices, if sincerely held, there’s no reason to be offended by another who professes a contrary opinion, and there’s no need to justify yours to them – though plenty of valid reasons to explain them.